NefretitiM: Tonight on Literary Links we have Alnisa Myers author of Why Does He love Me? Thank you for joining us tonight. So tell us when did you first realize that you wanted to be a writer? Alnisa Myers: I started writing poetry when I was 10 years old. I have notebooks and notebooks of poetry and songs I’ve written throughout the years. When I lost my grandmother, I began asking myself how I could turn my writing into something positive. It wasn’t until I became a mother that I took my thoughts serious. It has been a dream of mine for quite some time to create children’s books and to offer something positive for children to read and to understand. NefretitiM: Interesting, what is the title of your book? NefretitiM: What is the writing process like for You? Alnisa Myers: Poetry for sure. My coloring book collection is written in poetry form for children to enjoy. The smallest things tend to inspire me. It’s not hard for me to write what I feel, the hard part is actually having the confident to share my work with the world. NefretitiM: As a fellow artist I can certainly relate. What genre does your book fit into? Alnisa Myers: Religion, biblical, adventure, children, affirmations. NefretitiM: What do you like to do when you’re not writing? Alnisa Myers: Travel with my family and friends is my most favorite thing to do! NefretitiM: What tips of encouragement do you have for other authors? Alnisa Myers: Don’t second guess yourself! If you have a gift, share it with the world! NefretitiM: Well put! What does your family think of your writing? Alnisa Myers: My family is my biggest inspiration! My goodness, I don’t know what this journey would have been without their love and support. They encourage me, push me and love me unconditionally. NefretitiM: What was one of the most surprising things that you learned in creating your book? Alnisa Myers: That there are so many talented people in this world and it is inspirational to see and know so many gifted people! It inspires me to be a better me every single day. NefretitiM: Yes the journey certainly defines the destination and it is encouraging to meet gifted individuals along the way. Thank you so much for joining us tonight. I wish you much success on your author endeavors and look forward to interviewing you when you publish your next work. Get your copy of “Why Does He Love Me” tonight on amazon. I can’t wait to read my copy. 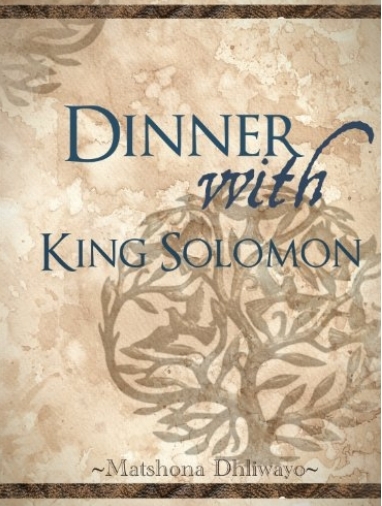 DINNER WITH KING SOLOMON is the story of a man named Kevin who lost everything: his wife, his children, and his business. He is close to giving up on life, but then King Solomon, the wisest man who ever lived, pays him a visit. Matshona Dhliwayo is a Canadian based Philosopher, Entrepreneur, and author of The Little Book of Secrets to Happiness, 50 Lessons Every Wise Mother Teaches Her Son, Lalibela’s Wise Man and 100 Lessons Every Great Man Wants You to Know. NefretitiM: Today on Literary Links we have Matshona Dhilwayo; author of Lalibela’s Wise Man. Thank you for joining us today. What inspired you to write this book? Matshona Dhliwayo: Each time life perplexed me, I would take a trip to the rural areas and sit before my grandfather, the first sage I ever met, and take in all of the nuggets of wisdom he imparted to me. NefretitiM: How did you come up with the title? Matshona Dhliwayo: Lalibela is the oldest monastery in Africa, to the best of my knowledge, where monks still reside. I always saw it as a place where my grandfather should have lived. He was a very peaceful man; one of the most spiritual people I’ve ever met. I put the two together and came up with the title: Lalibela’s Wiseman. NefretitiM: What genre does this book to fit into? Matshona Dhliwayo: Self-help/Inspirational. Some have compared it to The Alchemist. NefretitiM: What influenced your interest in writing? Matshona Dhliwayo: I was programmed before I came into this world to be a writer. Then, seeing how words had the power to influence people, I committed myself to honing my craft. NefretitiM: So, I’ve heard through the grape vine that you donate some on the proceeds from your book to charity. Can you speak more on this? Matshona Dhliwayo: 50% of all of the profits from my book sales will go to orphanages in Zimbabwe. It is my way of thanking the Creator for the gifts and talents he has given me. Matshona Dhliwayo: Watching documentaries. Listening to lectures. NefretitiM: What tips or words of encouragement do you have for other writers? Matshona Dhliwayo: Learn your craft. Learn from the best. Be true to yourself. Write from the heart. Edit from the head. Persevere, persevere, persevere! C.S & D.W: We have had many years of writing articles and other writings in the business world and have long wanted to collaborate on a more esoteric/spiritual/metaphysical project. After Cristina’s success with The Tao of Sudoku- Yoga for the Brain, her first book in the Sudoku Wisdom Series, it became apparent that our combined efforts could be to join my inspirational writings with word search puzzles and Cristina’s philosophical wisdom. This gave us, long time treasured friends, an opportunity to work together in a new way and it was and is a phenomenal journey. C.S & D.W: Darity calls herself A Modern Day Oracle and has been writing ~The Daily Oracle~ and then ~The Weekly Oracle~ since 2006…We felt the title was synonymous with the intention of the Sudoku Wisdom Series, Word Search and Darity’s Oracle messages. C.S & D.W: This is a fun perspective for personal development, self-help and opportunities to exercise your brain. As the subtitle reflects, this is Yoga For The Brain . C.S & D.W: Darity began reading at a very early age, mostly to escape the experiences of her childhood. The opportunities to escape influenced her desire, from early in her life to learn to spell, to play with words, to create stories, to learn more words, create a vocabulary. These influences gave her the ability to express herself in many different ways. This interest in writing carried through her undergraduate work and on through law school and her 35 year legal career as a business lawyer. Cristina has been writing pretty much all her life. Her mom kept reams of early writings to prove it. This process of collaborative writing with Darity and her brother Rick as well as her long time friend Melissa Morgan as editor, makes for extraordinary synergy. The love energy is almost palpable in just holding the book. NefretitiM: How does your collaborative process work? C.S & D.W: Cristina does all the work and I say yay!!! It is a great opportunity for us to play together as we create something new and different. C.S & D.W: Darity still loves to read. She has several books going at one time, fiction, non-fiction, metaphysical/spiritual. Darity serves on the Boards of Conscious Humanity, Inc. and the School of Universal Learning, a newly chartered school in San Diego, California. She is also Of Counsel to the Lotus Law Center. Cristina loves to read as she is curious about so many things. She enjoys supporting new authors as a book coach, cooking, traveling and communing with nature. She just found out about Goodreads and is really enjoying it! C.S & D.W: Darity’s perspective is to enjoy the process, stay committed to what it is you want to create, trust your intuition and just keep putting one foot in front of the other, trusting your Self to your practice. Cristina’s adds her encouragement for you to stay curious. Find one or two people who support you to talk to and stay away from naysayers. Be courageous in believing in yourself. And, remember you have a body and it’s important to take care of it- especially when you spend lots of time in the creative realms of the mind and imagination. NefretitiM: Great advice! Thank you for joining us. Much success to you on your latest work. NefretitiM: Tonight on Literary Links we have Tori Lynn author of The Divorce. Can you describe the time when you first realized that utilizing your creativity to write, was something you absolutely had to do? NefretitiM: Have you ever gotten writer’s block? Tori Lynn: I have Writer’s Block now. I started the new book “Taboo” that should have been released before Valentine’s Day but the person I was renting a room from suddenly wanted EVERY renter out. It was the middle of the winter and I have two kids. I got moved only to find, the person renting the room next to ours was a fugitive. The stress has caused writer’s block with Taboo but beginning of the new autobiography, The Journey. I just started a paragraph of notes. That’s all right now. It’s being trying being in a new state. NefretitiM: Did you ever consider writing under a pseudonym? Tori Lynn: Yes, I have a book in my head that I am considering it for. NefretitiM: Do you try more to be original or do you try to deliver what your readers want? Tori Lynn: My books are autobiographies but if I go with this novel, I’m an out-of-the-box type person but it’ll probably be what the people want mixed in. NefretitiM: How many unpublished and half-finished books do you have? Tori Lynn: One I published and both of my daughters have one published. I have 3 unpublished. NefretitiM: What does literary success look like to you? Tori Lynn: The Divorce has been turned into a short film starring Tommy Ford (RIP) who passed before we finished but I would love to make it a Feature. NefretitiM: What advice do you have for new authors? Tori Lynn: Throw up on paper first. Don’t try to fix and write at the same time. After a while, you will put what chapters goes where and so on. NefretitiM: Today on Literary Links we have April Canavan author of Path to The Key Destruction of Magic. Tell us Ms. Canavan, what inspired you to write this book? April Canavan: I knew that I really wanted this to be a series, and the key plays a prominent role. April Canavan: I wanted it to tell the story of how far a mother would go to protect her child. April Canavan: I curl up in a nest of blankets, and write. April Canavan: I love to read, and explore the woods. April Canavan: I don’t really know. I started writing when I was pregnant with my son, and this is the story that came out. April Canavan: If you want to write, then do it. If you want to read, then do it. Whatever your passion is, find it. NefretitiM: Good advise, best of luck to you! Get your copy of Path to The Key Destruction of Magic Book 1 at http://a.co/jbQpttq. It’s that time of year again. Are you an Indie Author? How cool would it be to have your self-published book recognized. Sign up for the 2017 Human Relations Indie Book Awards. With over 40 indie book categories that include topics related to human relations issues, family relationship issues, children’s books with a human relations focus, poetry human relations books, fiction human relations books and general human relations book categories. There are also several special needs categories included in this year’s contest. April 25th, 2017 is the deadline for submission!